The camera work was critical at the last FINA/HOSA 10km Marathon Swimming World Cup race held in China's Chun'an Qiandao Lake on October 15th. Both the winners of the men's and women's race - Kristof Rasovszky of Hungary and Ana Marcela Cunha - finished in the same time as the second-place swimmers - Allan do Carmo and Arianna Bridi - but with the use of the high-speed camera, the FINA race officials judged the Hungarian and Brazilian won their respective races. The Brazilian world champion won her 18th career title on the FINA professional marathon swimming circuit - in the tightest of races that had to be decided by judges in a photo finish. "I'm very happy with this result. It was a disputed finish that I won with the hand touch. 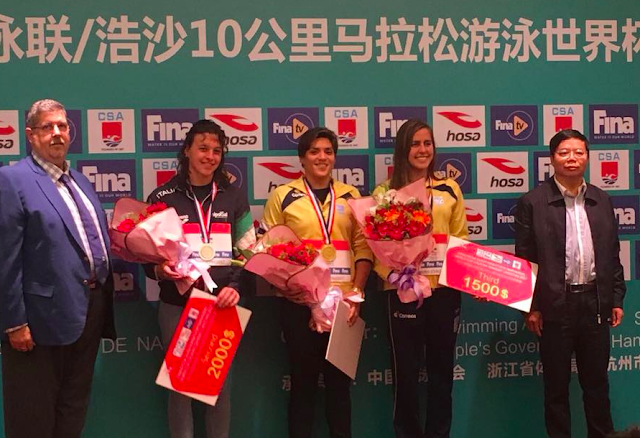 This victory was very important because I took the second ranking [on the FINA World Cup circuit], two points ahead of the Italian Rachele Bruni. The competitions in the recent years became more and more close, I was ready for that. My coach told me to swim as fast as I can in the last 200 meters. Though it was a rainy day but I like the water and temperature cold, the colder the better to be honest." Throughout the 2017 season, Cunha was non-stop, traveling and competing around the world. She finished 12th in the FINA World Cup race Abu Dhabi, UAE, fifth in the FINA World Cup race in Viedma, Argentina, fifth in the FINA World Cup race in Setubal, Portugal, second in the FINA World Cup race in lac St-Jean, Canada, first in the FINA World Cup race in lac Megantic, Canada, and first in Qiandao Lake. Additionally, she earned three podium positions at the FINA World Championships in Hungary, won the the 10 km Campeonato Brasileiro de Aguas Abertas Brasilia in Lago Paranoá, Brazil and the 36 km Maratona del Golfo Capri-Napoli in Italy.